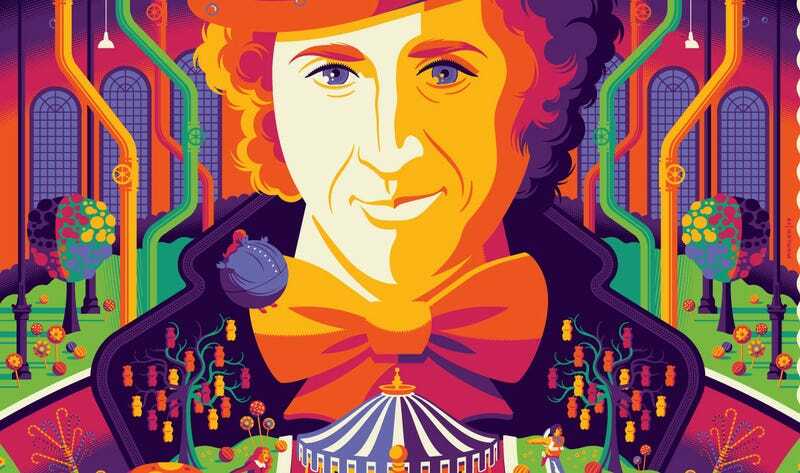 Willy Wonka and the Chocolate Factory is one of the most well-represented movies in pop culture art. The reason being it’s such a vibrant, wide-ranging movie, it offers almost innumerable visual interpretations. One such example is this new one by Tom Whalen, which is chock-full of detail and eye-popping brightness. That’s one of those posters that you notice something different every time you look at it. It’s really something special. If you’re interested in owning one of these, the poster will be available Friday, July 28th, at 12:30pm PST on DHM’s dedicated store page at this link. They both are 18 x 24 inches and cost $65 and $95 respectively. Each color variant comes in a Golden Ticket edition of 10 at a cost of $125. Check those out. Again, these all go on sale Friday at this link.